Music distribution companies charge you for their services. They may offer to provide a certain level of service — such as getting X number of albums in Y number of stores — and may offer you access to a particular record store. But should you ever take them up on their offer? Music distribution already costs money. A music distributor takes a cut of your album sales — that's how traditional distributors make money. 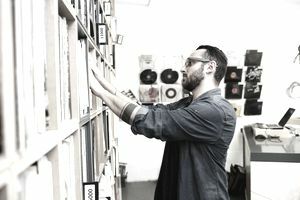 Part of the benefit of this arrangement is that the distributor not only has reason to get the record stores to stock copies of the album, they also have an added incentive to actively work with the stores to get the albums promoted on site — whether through special placement, sales, or in-store plays. If you're not paying the distributor for their services up front, then they need you to sell records if they're going to get paid. Getting albums into record shops is only part of the battle. Moving your album off the shelf and into the hands of the customers is what counts. As an indie artist or label, you need to work hard to promote your release to build awareness. When money is tight, if you divert precious cash from promotion to pay for distribution, your record might be in stores, but no one will know about it. Generating a poor track record with sales can hurt you in the long term. If your CD doesn't sell and sits buried among the thousands of competitors, the record store may take fewer units of your next CD, even refusing to stock it all together. You'll need to do some hard selling next time around since a brand new artist can generate more excitement in the retail marketplace than a musician with a record that's bombed. If you're simply looking for someone to put your album in stores, there are distribution services that gladly work with all labels without charging an upfront fee. These services make your product available — they do not actively sell your album, so they can't guarantee that it will be on the shelves. That might sound less appealing than paying for your album to be placed in stores, but unless you have the promotion in place to stimulate sales, it's really not. Of course, working with these distributors is certainly less desirable than landing a distribution deal with a label that loves your music and has a label manager on the phone pushing your album into stores.